Although the ranks of college-educated Americans have grown over the past quarter century, people lacking a degree still make up a substantial majority – two out of three Americans. And they are lagging far behind financially. 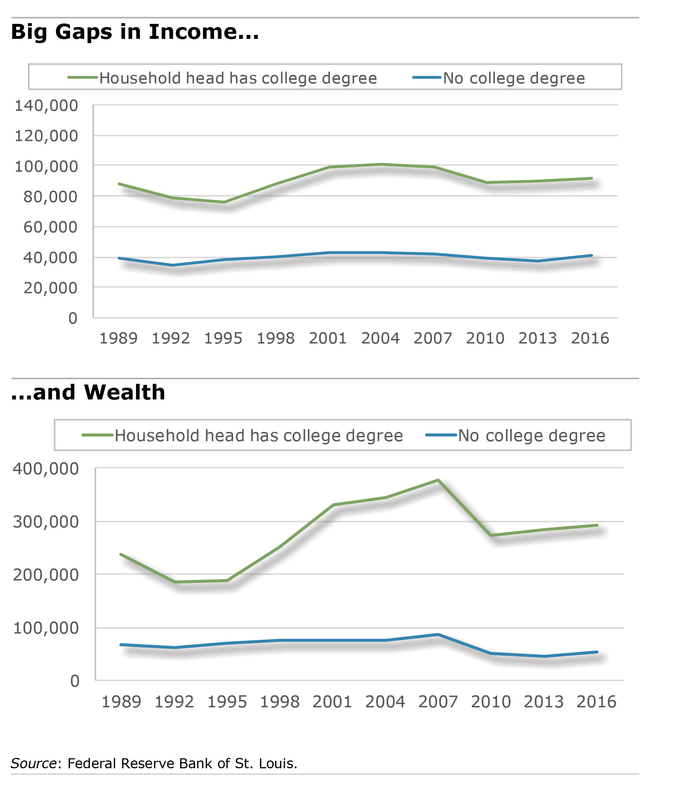 Specifically, households headed by a non-graduate have only one-fifth of the net worth – assets minus liabilities – of those headed by a college graduate. The income penalty is also large. The earnings of households without a degree are less than half of what a college-educated family earns. But there’s a positive side too. People born into families lacking a degree can rise swiftly if they break the mold and go to college. For racial minorities, the improvements are even more dramatic. On a ladder with 100 rungs representing family earnings, a non-white college graduate whose parents have no degrees will climb between 26 and 41 rungs higher than if they had not attended college. In comparison, a graduate with college-educated parents will move up 22 to 37 rungs on the ladder. College is the fastest ticket to improving one’s lot, but it’s also important to remember that most people either can’t or don’t want to go. Without defining the numbers within the graphs as being ‘median’ or ‘average’ seems a bit misleading. I thought that it would be the former but it was necessary to access the St. Louis Fed report to verify such.